Readers of this blog know VMturbo quite well. It’s been several years that this startup company expanding very fast. VMturbo Operations Manager is regularly updated, packed with new features and having the possibility to be installed not only on VMware or Hyper-V but also on Citrix, Redhat, Openstack or Nutanix. 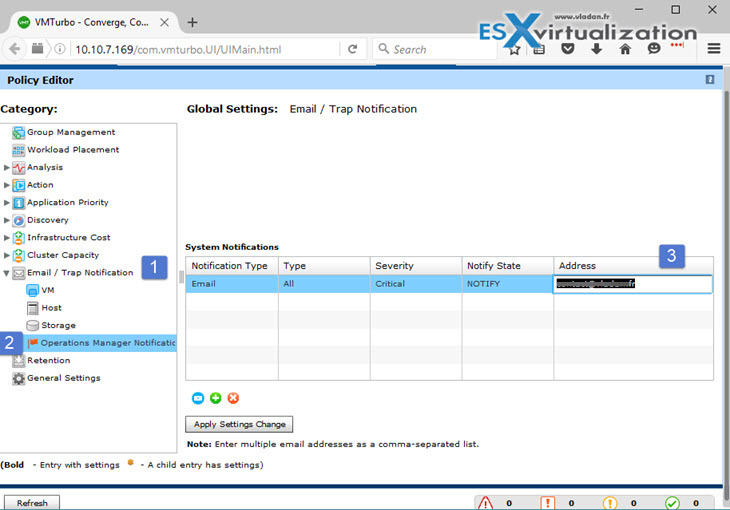 You could check one of the latest released in my recent post here – VMturbo 5.5 Extends its capabilities to VMware VRA, IBM PowerVM and Public Cross-platform Migration. Today we’ll review (or try to) the product from the admin perspective. It means we’ll show how quick the deployment process is, what’s the “look and feel” of the environment. Additionally, we’ll try to do some more and show some reports. We’re running VMware vSphere 6.0 currently in the lab. The VMturbo product is distributed as a virtual appliance and it’s very easy to deploy. 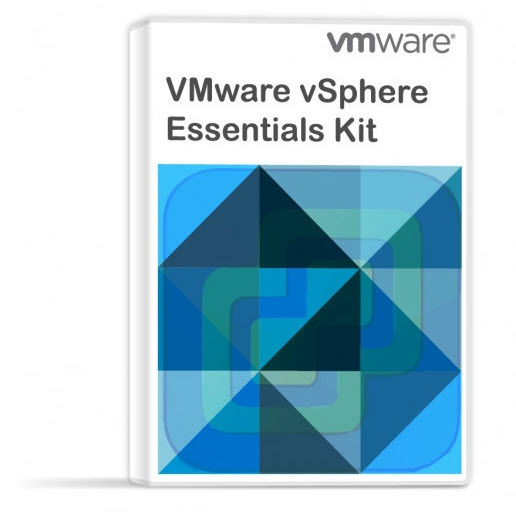 For those of you who deployed VMware vROPS, you know that it’s quite difficult to master. There is a learning curve in order to obtain what you need. 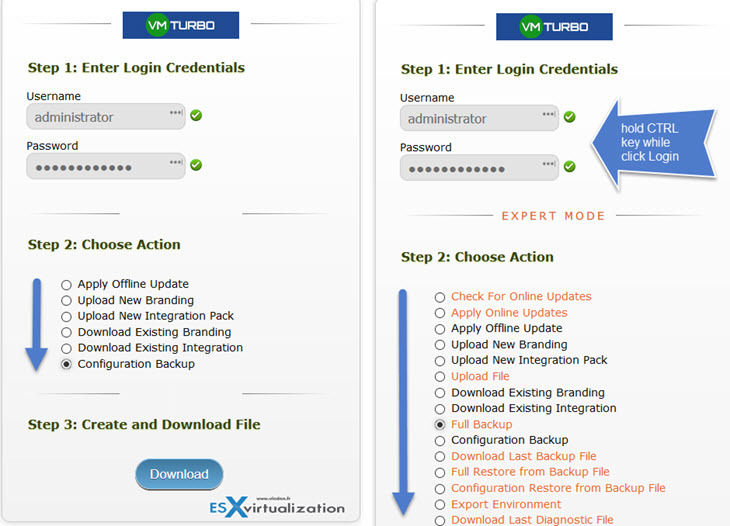 VMturbo’s product seems more “user-friendly” (or more admin friendly). It’s not to say that it’s super easy, but in my own experience, it’s been more effective. I’d imagine the “sweet spot” between 50-100 VMs, in order to start seeing benefit from VMturbo when new servers and applications are constantly being added to the environment and the workload is unknown. You’re kind of “losing sight” when the environment starting to be larger and larger. VMTurbo will help to size and allocate those workloads efficiently, to make sure you are maximizing your resources. The thing is that even you right-size your VMs during the deployment phase, a few weeks later your workload is different and users might start to complain about performance. This static guess work can work up to a certain point, but as environments get more complex, you need something that continuously analyzes your workloads in real time, and takes actions before a performance begins to suffer. The initial setup was straightforward. You deploy an appliance, give it the normal basic configs then wait a few hours and you start having data to act on. Let’s get started. 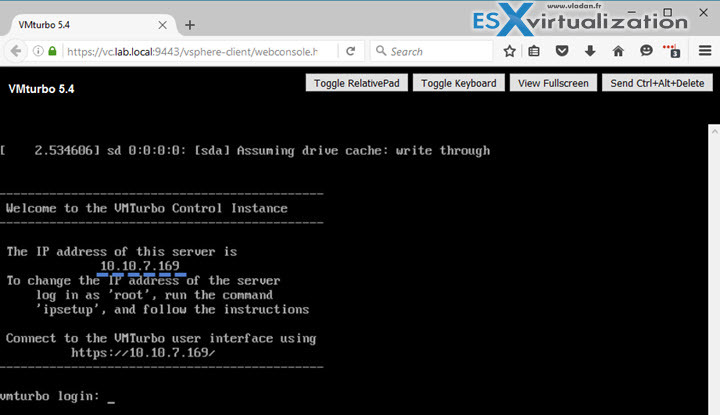 Deploy the OVA through the vSphere client or vSphere web client. Once done, wait till the VM is up. Then you can see the IP address of the web interface through the console…..
By default, the appliance tries to pick an IP address through DHCP. If your environment does not allow, or there is no DHCP server, you want to configure fixed IP. You can, of course, setup fixed IP. Steps: login as root (password: vmturbo) via the console/SSH and type “ipsetup”. Note that the console root login and password are different from the web UI login…. address. So back again to the Web UI where we continue the initial config. After the first connection with those default credentials (you’re prompted to change the password for something else immediately within the assistant), you find in front of a Summary assistant like this. Open your welcome e-mail where you’ll find the XML file attached. Open the file with notepad > copy the content > paste the content into the next screen within the deployment wizard. Next, the wizard asks you to add a target. In our lab case, we’re using Hypervisor so in the list of supported hypervisors we need to chose VMware. 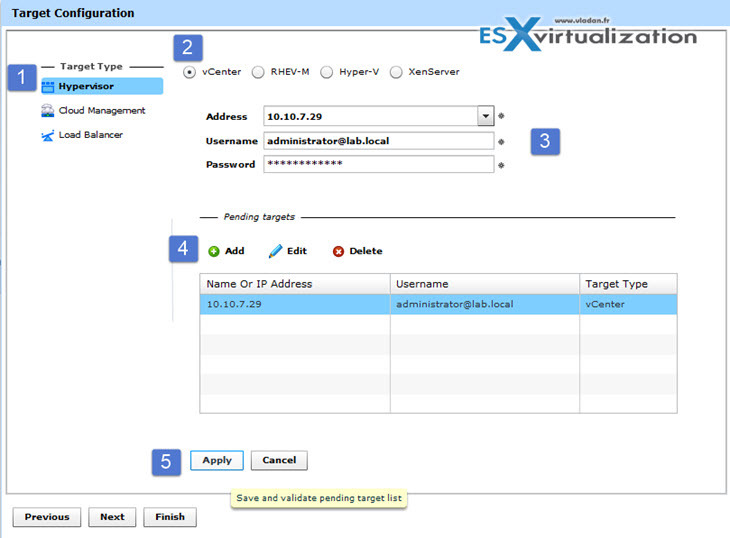 So we successfully deployed VMturbo Operations Manager appliance and waited for some time. The wait time varies and depends on how large your environment is. 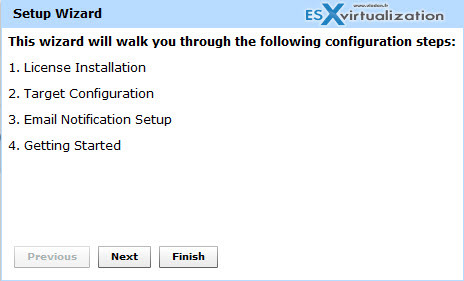 VMturbo can also scale out by deploying additional appliances. By aggregating multiple instances in this way, you can view the entire environment through a single GUI. One special installation of Operations Manager serves as the aggregating instance, and it displays the combined data from each underlying target instance. This brings together the recommended actions, dashboards and summary displays, reporting, and other data in one application view. The UI is rich, fast and intuitive. The main menu is at the top. If you, for example, start with the Inventory Tab, You can pin it Inventory to the left so it does not float around. It’s sometimes necessary to justify costs. So it’s important to know what’s used and what’s not. The VMturbo can figure out the needs, set up some reports that would be emailed each day during few weeks period of observation. Then it’ll give you further details on the whole insights of your VM Environment that you’ll needed and finally can present it to your boss. VMturbo is excellent at reports. There are tons of reports pre-defined. If your boss asks you for example to show the current usage of the management or production cluster, it’s not very difficult to find an already pre-built report or customize your own one. You can generate reports from Inventory tab where you select the desired inventory section and click the Generate report icon. Then enter administrator as a username and yourpassword as a password. Then hold CRTL key and click Authenticate button. As you can see you’ll get many more options compared to “standard” login (without CTRL). It’s an Expert mode. VMTurbo Operations Manager’s supply chain recommendations allow you not only optimize the resources across the cluster nodes but actually places VMs to improve their performance. As a capacity planner, its plan modeling component of VMTurbo Operations Manager on a continuing basis to plan and track our VMware cluster capacity consumptions. In our experience, the modeling tool has paid for our VMTurbo Operations Manager licenses many times over in the last few years. VMturbo Suggests if resources are not being efficiently and should be reduced wherever required. Resizes VMs according to usage. Users no longer have to call the IT department with a request to increase RAM from 3-4GB, etc…. Can analyze and optimize storage usage for the VMs. Can Give you a good insight on future needs via Plans. Please note that this review was sponsored by VMturbo.